South Africa is in the midst of one of the most serious droughts in living memory. 2015 was the country’s driest year since records began in 1904. The agricultural sector is being devastated. 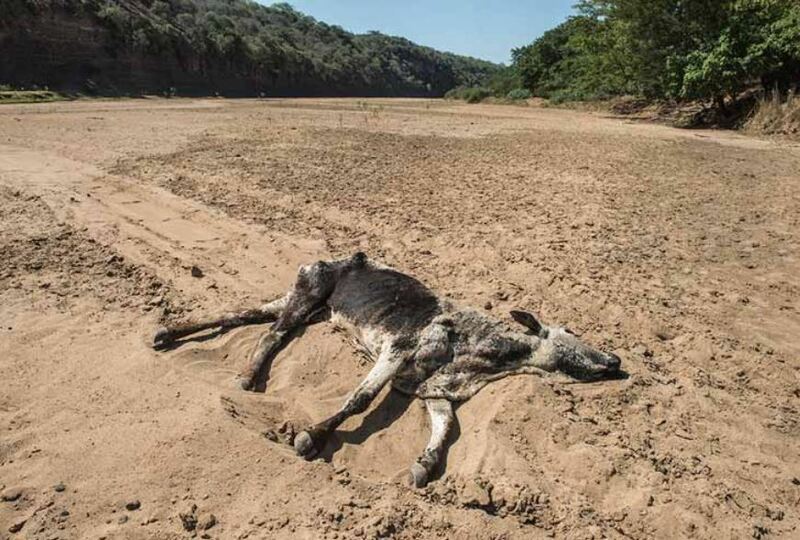 Scorched crops and grazing land have forced livestock owners to kill or sell their animals. The carcasses of cattle that have succumbed to hunger and thirst litter barren, dusty fields. Small-scale farmers watch daily as their cattle die and livelihoods disappear. Millions of South Africans face hunger. Yet it is not just rural people who are being affected. Food inflation has been sky-rocketing. Together with the impact of the current economic crisis, it is throwing millions of South Africans into even worse levels of poverty. According to the National Income Dynamics Study (NIDS)‚ launched by the Department of Planning‚ Monitoring and Evaluation in Pretoria on 8 September 2016‚ 28% of those who were poor in 2008 now live in severe poverty. The current drought will make things even worse. South Africa is a water stressed country, with an average rainfall of about 450mm, which is well below the world average of about 860mm per year. It is estimated that South Africa is the 30th driest country in the world. South African water resources are divided into 19 water management areas, out of which 6 face moderate shortage while 9 encounter severe shortages. Climate change is making things worse. A recent estimate of the climate change effects on water resources suggests that South Africa may experience a reduction of 10% in average rainfall, reducing surface water runoff up to 50 – 75% by 2025. It is also estimated that even before the current drought, the country is using its water way beyond what is sustainable. Currently, more than 98% of South Africa’s available water supplies are allocated. With limited options left for new dams, ever-increasing demand owing to new coal-fired plants and water pollution from coal mining, the country’s demand for water is expected to outstrip supply by 2025. For years people have been warning about the impact of climate change, especially for dr countries like South Africa. 2015 was the hottest year in recorded history and it is likely that 2016 will be even worse. El Niño is the immediate cause of the drought. It has crippled countries from Ethiopia to South Africa. Combined with the long term impacts of climate change, it puts more than 36 million African people at risk of starvation. El Niño is a complex and naturally occurring weather pattern that results when ocean temperatures in the Pacific Ocean near the equator vary from the norm. The phenomenon typically occurs every two to seven years. The 2015 – 2016 El Niño, however, is being called a “super” El Niño, the worst in 15 years. A 2014 study suggests that super El Niño events could double in the future due to climate change. Using 20 climate models to examine possible changes in El Niño over the next 100 years, the scientists projected that extreme El Niño events could occur roughly every 10 years instead of every 20. While Ethiopia is the country most devastated by the drought, South Africa is also reeling under the impact. Many towns no longer have water. For example, Swartruggens in the North West has been without running water since November; its dam is completely dry. You have to wonder which planet some our ministers live on. Marie Antoinette is supposed to have told starving French peasants to eat cake when they could not afford bread. In a similar vein, Minister of Water and Sanitation, Nomvula Mokonyane, responded to the drought by urging South Africans “stay out of their jacuzzis, use a glass of water when they brushed their teeth, and use wet wipes to remove their make-up”. “Use wet wipes to remove make-up”! Who is she talking to? How much water would be saved if South Africans followed her proposals? Domestic consumption of water is relatively low when compared to industry. Currently 63% of water is used in agriculture, almost all of which is consumed by commercial agriculture. Only 44,7% of South Africans households have a tap inside their dwellings. 16,7% have a tap in the yard, 19,8% fetch water from a public tap, and over 14% access water from dams, rivers, boreholes, rainwater, water carriers or tankers. In spite of the overwhelming need to provide water to poor and rural households, more and more water is being allocated to mining, especially coal mining. According to recent reports commissioned by the Department of Water Affairs, the South African government is contemplating taking away water rights from farmers and handing them over to industries that can derive “maximum benefit” for the local South African economy. Already mining uses 3% of the total water consumed, while Eskom is responsible for 2% of total water consumption. Coal mining, in particular, uses vast amounts of water in its operations. It has recently been reported that 125 coal mines (including 11 out of the 22 coal mines that supply Eskom) are currently operating without a valid water license. It is not just mining and Eskom’s water consumption that is a problem. It is also their pollution of South Africa’s scarce water resources. For example, the Kusile, mega coal-fired power plant is not able to use the nearby Olifants River to supply the 2,9 million litres of water an hour needed for one of the biggest power stations in the world. It will have to secure its water from the Vaal, many hundreds of miles away. The Olifants water catchment has been so polluted by coal mining, its water cannot be used! Of all industrial sectors, mining has the greatest impact on water quality. The effects of mining include changes in ph (acidity), increased salinity, increase metal content and increased sediment load. 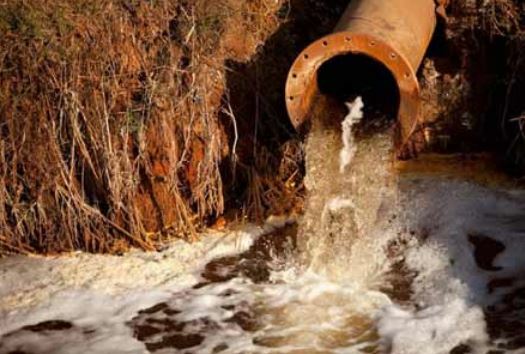 In the mining areas around Johannesburg the polluted groundwater discharging into streams in the area contributes up to 20% of the stream flow. The effect of the contaminated water from the mines can persist for more than 10 km beyond the source. Acid mine drainage (the outflow of acidic water from a mine) poses a massive threat to our water resources. The potential volume of acid mine drainage for the Witwatersrand Goldfield alone amounts to an estimated 350 Ml/day. This represents 10% of the potable water supplied daily by Rand Water. As this underground polluted water rises to the surface, it becomes a part of the drinking water that is utilised by both the urban as well as the rural population. Scientists estimate that in just a few years, up to 80% of South Africa’s water will be undrinkable. Moreover, the intake of this water is highly hazardous to human health as a result of the presence of uranium in the water. Should scarce water resources be allocated to the coal power industry, an industry that according to South Africa’s commitment to the Paris Climate Change agreement will have to be downscaled? Most of the coal mined in the country is used in Eskom’s coal-fired power stations. 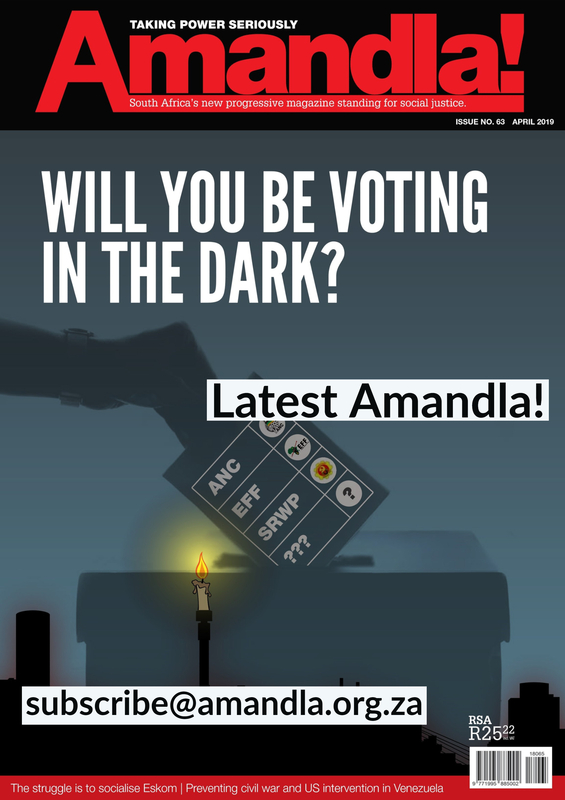 Almost 92% of South Africa’s electricity is generated by burning coal. 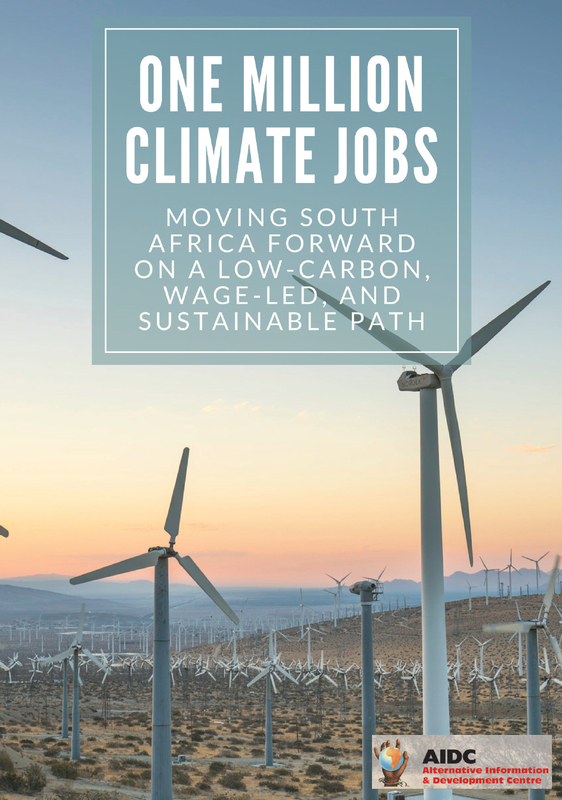 Coal fired generation of electricity and mining are mostly responsible for making South Africa one of the most energy intensive and consequently carbon intensive economies in the world. Per-capita, South Africa is estimated to be the 7th most carbon intensive country in the world. 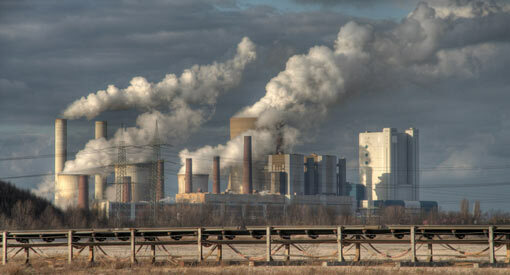 It is the emission of carbon dioxide that is responsible for climate change. And it is climate change that is behind the current drought. So it is South Africa’s continued reliance on coal which goes to the heart of whether we can keep our taps running with clean water, and most crucially bring water to the half of the rural population without access to clean running water. Though South Africa’s electricity generation activities and large industries only account for 6% to 8% of total water consumption, these activities are located mostly within moderately and severely constrained water management areas. Taking all this into consideration, the South African government should focus on weaning itself off coal as both the source of electricity and export revenue, rather than think of using wet wipes as a desperate attempt to conserve water. South Africa has some of the best renewable energy resources in the world, both wind and solar. Wind uses 173 times less water than mega coal fired plants like Medupi and Kusile. It is urgent to take on the vested interests that stand in the way of transitioning to a low carbon development path. The current drought points to the extreme urgency. To coin a phrase, while Rome burns, Mokonyane fiddles.